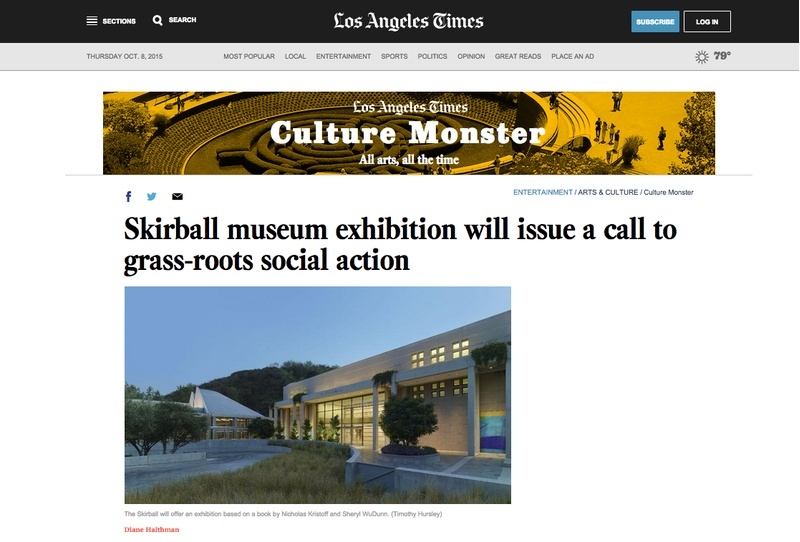 C&G Partners' latest exhibit design project, "A Path Appears: Actions for A Better World" opens at the Skirball Cultural Center in LA on November 19, 2015. Inspired by Nicholas Kristof's best-selling book of the same same, "A Path Appears" illuminates how every visitor can take practical, results-driven steps to bring about social change. Read the recent LA Times feature on the exhibit and learn more here. This latest exhibit design project is a collaboration between C&G Partners and wHY Architecture on design, the Skirball Cultural Center as presenters and curators, Cinnabar LAfor fabrication. The guest curator is Neal Baer, MD, who is who is a pediatrician, television writer/producer, and creator of ActionLab.org, a new website that links narrative media to citizen action. “A Path Appears,” which will run at the Skirball from Nov. 19 to Feb. 21, will be presented in cooperation with the World Policy Analysis Center and the Global Media Center for Social Impact at the UCLA Fielding School of Public Health. Stay tuned for further details about “A Path Appears” in mid-October.